Training extensively with your 45 ACP pistol is a great investment in your personal safety -- we suspect that you keep the thing locked and cocked so that it’s ready to go at the precise moment you most need it. 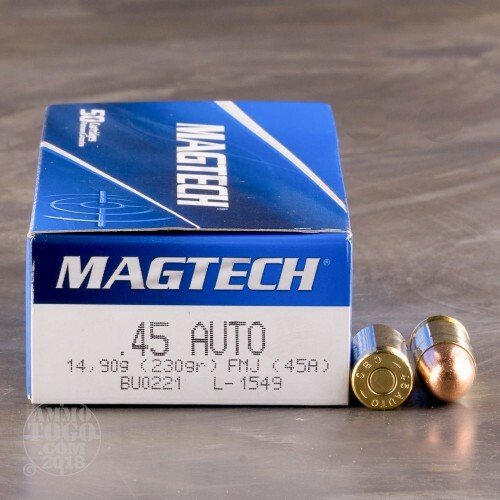 You need the proper fodder to keep your skills intact, of course, which is why we offer this ammo by Magtech! It boasts stellar quality for the low price it goes for, so you’ll have little reason not to go out and hone your aim to a fare-thee-well. This cartridge is capped with a 230 grain projectile, a bullet weight that the 1911 crowd is intimately familiar with. 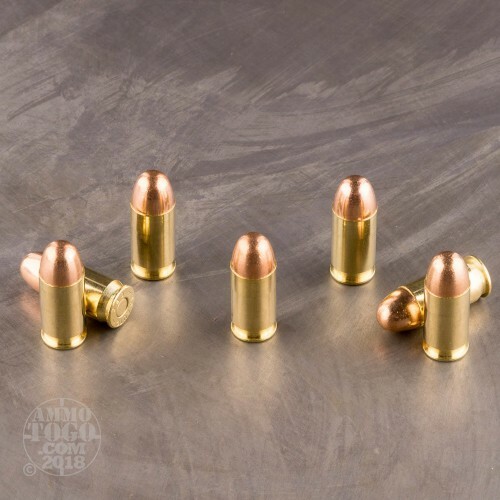 The bullet wears a full metal jacket to promote steady feeding in a semi-automatic pistol, prevent rapid lead residue accumulation in the bore, and facilitate penetration through a great variety of targets -- even the unconventional ones that are so often employed for plinking. 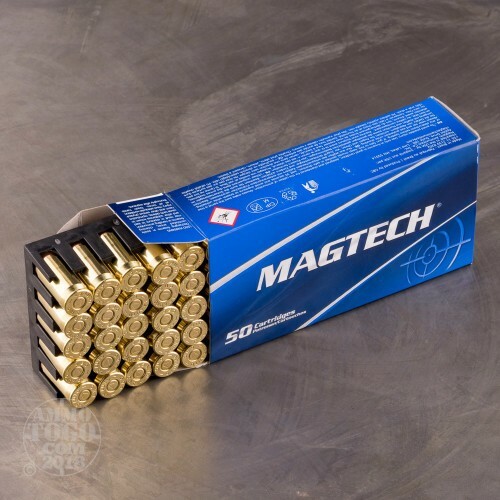 Magtech made each of these 1,000 rounds’ brass casings virtually identical to one another, so they carry consistent propellant charges and cycle interchangeably. 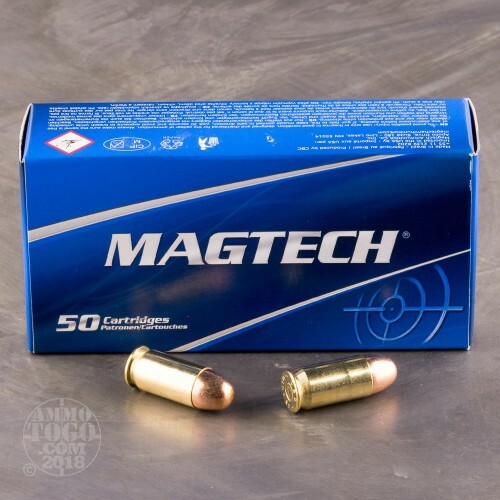 Magtech’s large pistol primer is non-corrosive, so you needn’t worry about the negative implications of sitting on this case of ammo for a long time. This is the most accurate .45 acp ammo I've ever fired through my EAA Witness compact, don't recall ever having a single misfire or hangfire with it either. Recently qualified for my CCP with a score of 287 at 25 yds. with an NRA instructor using this same ammo and I don't even shoot very often. I was very pleased. The package looked beat up when it arrived...but, it was fine inside the box. Good ammo and it was delivered at the time and in the condition as promised. I will buy from them again. I like this ammo. Its clean burning and I have no ejection or feeding problems. I shoot a Colt Series 70 and two EAA SAR K2's. No problems. This ammo is extremely clean and consistent. The cases have a polished feel, not oily, but almost slippery. The lack of tackiness that I find in some brass cases is absent. They feed cleanly and shoot accurately. Very accurately. I just found my "go to" target ammo. Magtech is superior ammunition. Magtech is decent clean burning consistent target ammo. Good for speed steel and IDPA. My review is about the OUTSTANDING customer service you receive with Ammo To Go. The first shipment was damaged by Fed Ex during shipping and after several days of the package being in limbo with no information available from Fed Ex I was finally alerted that the package was too damaged to be delivered. I notified Ammo To Go with this info and within two days I had a replacement package on my doorstep. These guys are simply the best at what they do!